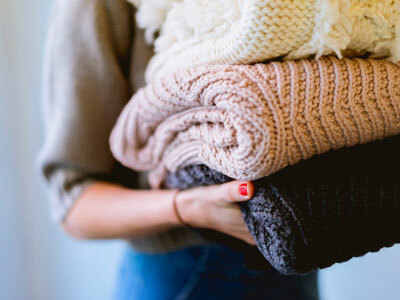 The holidays can be a good time to discuss death cleaning with your loved ones, and to start sorting through beloved belongings together. 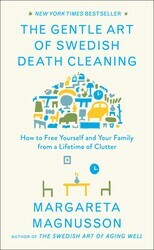 Margareta Magnusson, author of THE GENTLE ART OF SWEDISH DEATH CLEANING, explains the meaning of death cleaning and gives her insight into how to broach the topic the next time you go home to visit family. The holidays are here. That warm and lovely time when many of us travel far and wide to reunite with family and often parents. Parents who are growing older. If you’re unlucky, they are also the owners of a mountain of stuff, precious only to them. And guess who will have to eventually take care of all that stuff? During this holiday season, give yourself and your parents the gift that will keep on giving: talk to them about death cleaning. Death is the toughest topic. But, death cleaning doesn’t have to be. In fact, in Sweden we actually have a word for it – döstädning, literally Dö/Death, Städning/Cleaning – which is a very useful and practical approach to what can be a difficult or frightening moment. Whether you’re middle-aged and facing your parents’ passing, or thinking of your own, there is no time better than the present to prepare for death. My goodness, we plan for everything. Why not plan for death? When I was young, it was considered rude to speak your mind to an older person, including to your own parents. Thankfully, today we generally believe that honesty is more important than politeness. At best, we combine the two. Talking about death cleaning can be a way for generations to talk to one another about what is important to them. Old people often have balance issues. Rugs, stacks of books on the floor and odd items lying about the house can be serious safety hazards. Perhaps this can be a way to start your discussion: ask about the rugs. Are they really safe? Do they need to be there? Or mention that there are certain items in their house that you’d like to have and could you perhaps take them now? They might be relieved to get rid of a few things and finally see the promise and possible enjoyment of beginning to death clean for themselves. If they seem ready and willing, start by checking the basement or the attic or the cupboards by the front door. Pull out what’s hidden there. It may be a dollhouse or ice-hockey equipment, things they did not need or want around anymore. Perhaps the dollhouse could be a special gift for a granddaughter or neighbor; the hockey stick delight a stranger who finds it in a thrift shop. A small piece of advice: don’t start with photographs or letters. It can be fun to go through these, but you will definitely get stuck down memory lane and may never get around to cleaning anything. In general, when death cleaning, size matters. Start with the large items and finish with the small. There is a song that Anni-Frid Lyngstad from ABBA used to sing: ʻOnly count the happy moments, and forget the ones that cause you sorrow . . .’ It is so important to make time (and room) for happy moments that will become good memories later on. Spending a cold winter day death cleaning with your family is a way to relive happy moments past and improve the present situation by removing some skrap (Swedish for junk). Your future self will thank you. 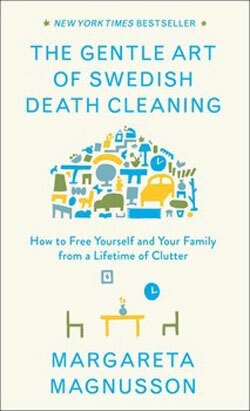 For more advice on death cleaning check out THE GENTLE ART OF SWEDISH DEATH CLEANING by Margareta Magnusson!